There’s a wealth of tactics floating around the SaaS world at the moment, and in terms of optimizing what’s working or creative fuel for new experiments — these are fantastic resources. But don’t confuse the myriad of tactics available with real business building. It’s easy make things complicated and get backlogged with a huge list of to-dos, many of which won’t move the needle or help solve for strategic priorities. At Scaleworks, we’ve distilled the 6 Rules that we laser-focus on for SaaS companies we work with. Here they are. Too many entrepreneurs are afraid to charge real money for their product. It’s an unfortunate cliche that if you can build something you tend to undervalue the price others will pay for it. Price should be constantly evolving, much like the product, market and customer. Test various prices and price models, be very careful about grandfathering, and charge for value given. Also — beware freemium, it is not a revenue model, it’s a very expensive marketing tactic. Free trials are fine. Freemium should only be used if that cohort demonstrably refers paid users. Product tends to get too much focus in software companies. The reality is product is easy to build and founding teams are passionate about their product. The real magic though is in demand generation and effective on-boarding. Finding channels to test, working on activating new leads and discovering where scalable levers exist is enormously important. A simple ratio is there should be at least $1 allocated to Marketing for every $1 spent on Product. Also — there’s gold in the data — it’s not easy to get it right but the entire team should be metrics driven and searching for insights in the data. There’s too much money sloshing around SaaS. 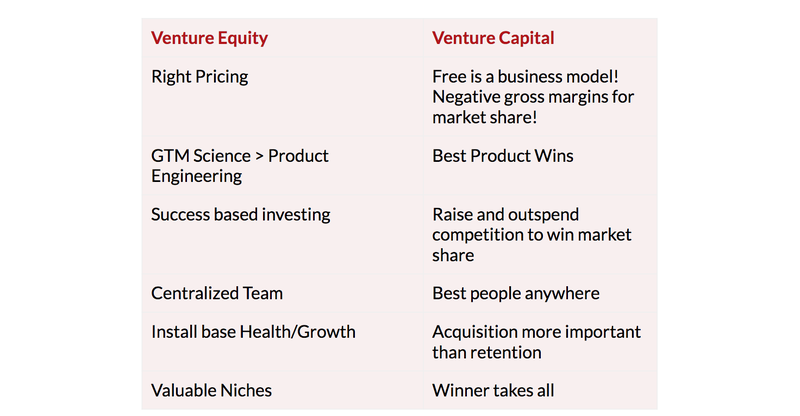 Venture Capital should be used to fund time-consuming R&D and setup capital — neither of which are required anymore for the majority of SaaS startups. Scaleworks invests where the dollars will be used to pour fuel on a scalable campaign that we know will deliver revenue. Surely to be controversial, but the reality is in a small company where everything is up for debate, change is constant — not being able to huddle in a room, or informally chat over a coffee, gives up a lot of what makes startups win against large companies — speed. That’s not saying zero people can work remote, but building an entire company remote just raises the already high barrier to success. It’s simple — acquiring new customers is more expensive, more time consuming, and more difficult to continue doing than keeping the customers you have. The Install Base has two primary factors — keep churn low by listening to customers and iterating to continue delivering value; and work on having a product thats usefulness grows over time so customers will happily pay more for it over time. The metric here is that without new customers, the business should still grow. Business SaaS is not winner takes all — there’s plenty of room to be one of the leaders and succeed, and even more so to refine a sub-category and be #1 in that. It’s very important to have a clear vision, strategic direction and market position, and it takes a lot of effort to figure these out — market knowledge, product and marketing creativity, and constant customer conversations. No doubt this list will get more nuanced over time. We talk a lot about our ‘playbook’ in Scaleworks and this at a high level is it. Common sense business building. It just so happens that common sense is a misnomer as it’s not common at all!